President of the United States , Donald Trump made an unusual comment about her hair on Friday, admitting, as a joke, suffering from baldness. "I do my best to hide this baldness, hard work," Trump said during a speech to a conservative organization outside Washington. "Not bad, eh? We're working on it, "he added, in an unusual display of self-deprecating humor. Trump's hairstyle has been the subject of comment for years, with much speculation from the press about wearing a wig. 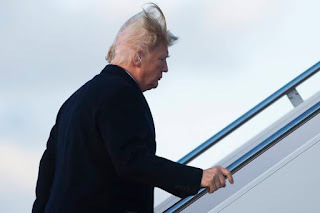 The president has denied the rumors several times and insists his hair is true, but admitted to using spray.